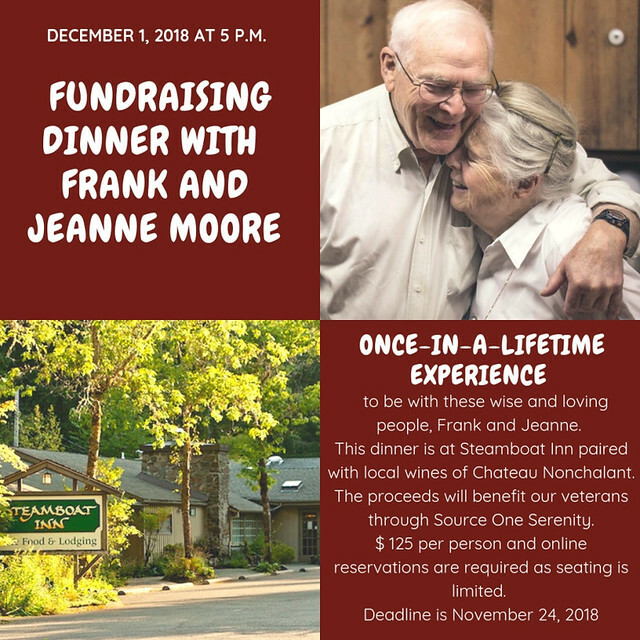 December 1 2018 5pm, Fundraiser with Frank and Jeanne Moore at the Steamboat Inn. Source One Serenity was born out of Frank Moore’s fly fishing vision and its potential life-altering benefits for our veterans struggling with PTSD and similar issues. Rusty Lininger, the Founder of Source One Serenity, met Frank in Luxembourg in 2013, when Frank had gone to fish the rivers of Normandy that he long ago traversed as a soldier. Frank is an inspiration for many people. He is local angling celebrity, a land steward and an advocate for protecting our natural wild places. The four-course dinner will be paired with excellent local wines from Chateau Nonchalant Vineyards which are hidden away in one of the Hundred Valleys of the Umpqua. The dinner will be held at Steamboat Inn, which is considered a Mecca for fishermen the world over. Steamboat Inn was founded by the Moores in the late 1950s. If you have any questions, please contact us at 541.580.5655, or email: elena@sourceoneserenity.org.